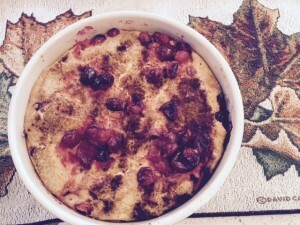 January is the time of Capricorn and this recipe will give them that comforting, traditional food Capricorn craves and use up the last of those cranberries! I made this with gluten free bread because I have a friend who really needs to go gluten free and it worked fine but another cup of cream. In addition, you can use low fat cream – it is a little less thick – but who needs more fat after the Holidays? Place the bread on a sheet pan and toast for 15 -20 minutes until just lightly browned. Be sure they do not burn. Remove from oven and raise temperature to 350 degrees. In a medium saucepan over medium heat, combine the half-and-half, cream, and vanilla bean. Heat stirring constantly – make sure it doesn’t stick or boil over. As soon as it starts to bubble, remove from heat and set aside for 15 minutes. In a large mixing bowl, whisk the eggs and sugar together until well blended and then slowly whisk in the cream. Remove the vanilla bean and then add in the bread making sure they full absorb the cream. Fold in all but ¼ cup of cranberries, cinnamon and nutmeg. Pour into the baking dish or ramekins and decorate the top with remaining cranberries. Place the pudding dish-roasting pan and then add enough water to come ½ up the side. Bake until set – about 45 minutes for a large dish and 30 minutes for ramekins. This can be served warm or chilled. I prefer room temperature.